Tyler “Ninja” Blevins — the world’s most popular Twitch streamer and widely considered the No. 1 Fortnite player on the planet — is living his dream, live on stream, playing a game he loves for a living. That also happens to be the dream for thousands of poker players around the globe. But just how similar is life in the upper echelons of Fortnite and poker? There aren’t many jobs for which taking a couple of vacation days means potentially losing hundreds of thousands of dollars. Then again, there aren’t many people with jobs like the one Tyler “Ninja” Blevins has. The 27-year-old phenomenon from Chicago, Illinois has been playing video games professionally since 2009 under the nickname “Ninja”, kicking off his career with Halo 3 before moving on to PlayerUnknown’s Battlegrounds. He began streaming his play on Twitch in 2011, successfully growing his channel until he had a massive 500,000 followers. That was in September 2017. Then Blevins started playing Fortnite. By March 2018, he had 1.75 million followers. And now, at the time of writing, his Twitch channel is the world’s most popular, boasting 13.49 million followers and an average of almost 400,000 viewers a day. What makes Blevins so popular? For starters, he’s incredible at Fortnite. With more than 125 million active Fortnite players across the world, “Ninja” somehow stands apart and wins at an unbelievable rate (more on his prowess later). He’s also a fun, entertaining streamer, able to engage with his ever-expanding audience whilst simultaneously crushing souls in a game with an ever-expanding player pool. All of this success has made Blevins very famous. Like, superstar famous. There have been months when he’s had more social media interactions than anyone else in the sports world, even beating Neymar and Cristiano Ronaldo. It’s made him very wealthy, too. In a 2018 interview with ESPN.com, Blevins suggested his monthly income was close to seven figures, thanks to Twitch subscriptions, fan donations, and sponsorships with Samsung, Red Bull, and Uber Eats. Such success comes at a cost, though. Blevins told ESPN.com: “The more breaks [streamers] take, the less they stream, the less they’re relevant.” In the world of Fortnite and Twitch, that means every decision Blevins makes to step away from the cameras and computer screens not only has financial repercussions (he can lose as many as 40,000 subscribers over a weekend with no stream, each worth roughly $2.50 to his bottom line), but could potentially result in him falling behind in the game he loves. The game at which, right now, he’s arguably the best on the planet. Now, if the name “Ninja” is new to you, the game of Fortnite probably is too. Let us explain. Fortnite is an action-packed online video game in which players fight against each other using weapons and tools while building forts in order to both attack and hide from opponents. The most popular version of the game by far is Fortnite Battle Royale, a free player-versus-player format typically played solo, in which 100 players are dropped onto an island and must scavenge for weapons, items, resources, and even vehicles, all the while attacking others in order to stay alive. The last player remaining is the winner. If that plot seems familiar, chances are you might have seen the recent Hunger Games films, or better yet (in our opinion), Kinji Fukasaku’s magnificently violent dystopian thriller — simply titled Battle Royale — which plays out much like a game of Fortnite. But Fortnite Battle Royale might also seem familiar to tournament poker players. Grinding your way through a multi-table tournament (MTT) bears many similarities to Fortnite. It’s also every player for themselves, hunting for chips by attacking the stacks of other players. Players have to think fast and act swiftly. Both games force player encounters as time ticks on. The Fortnite map shrinks throughout a game to bring on conflicts, much as the blinds and antes in an MTT increase to encourage all-in collisions. The closer we look, the more similarities we find between Fortnite and poker, particularly when pondering the day-to-day lives of those who play either game at the highest level. Just like Blevins, the best poker minds in the world will tell you that taking breaks from playing and studying (albeit longer breaks than just a couple of days — let’s say a month or two) can also have drastic consequences affecting performance and income. Life at the top? It’s a constant battle. Let’s say you took three MTT players who have reached the top in three different areas of poker: live, online, and Twitch poker. How might their lives compare with that of Tyler “Ninja” Blevins? When it comes to comparing Blevins with the titans of live tournament poker, there are plenty of worthy candidates. Right now David Peters, Stephen Chidwick, and Bryn Kenney all come to mind. But it would be remiss of us not to place Justin Bonomo at the top of the list. Like Erik Seidel (2011 – $6.5M), Dan Colman (2014 – $22.3M), and Fedor Holz (2016 – $16M) before him, Bonomo went on a tear in 2018, cashing for an astonishing $25.4 million and chalking up the greatest year any tournament player has ever had in terms of winnings. Over that 12-month stretch, Bonomo was winning Super High Rollers at an absurd rate. Speaking of absurd win rates, let’s go back to Blevins for a second. When “Ninja” straps on his trademark headband and settles in for a Fortnite session, he tends to win. A lot. Lifetime, his win rate is an astounding 36 percent, meaning he wins one in every three 100-player Battle Royale he plays. Just think about that for a moment. If a poker player were winning at such a rate, would enough other players even bother turning up for the tournament? Well, for the first seven months of 2018 it seemed like Bonomo was doing exactly that. From January to July, Bonomo won 10 titles, including two World Series of Poker bracelets and two Super High Roller Bowl victories. Narrowing it down a little, from May to early June Bonomo cashed in seven events. He won six of them. And yet it happened. So let’s say, hypothetically, that Bonomo continued to win tournaments at such a rate. How would that impact the poker world? Would the wealthy amateurs bother to play anymore? Would that discourage other Super High Rollers, Bonomo’s peers, from playing as much? It’s interesting to think about until you remember a couple of things. Unlike Blevins, who has built his fame and fortune by winning on Fortnite time and time again (to name just one reason), in poker you don’t need to clinch the top spot and the trophy every time in order to sustain yourself. As you can see from the table above, Bonomo was also cashing huge with close calls, so it’s safe to say that other members of poker’s elite would still turn up to battle even if one player won 36 percent of the time. Luck in poker also plays a huge factor. An amateur player with limited experience can beat the top pros and win a tournament on any given day, and the thought of doing just that is what brings them back time and time again. In turn, those same amateurs create the value that Super High Rollers seek. When Blevins is dropped into a new game of Fortnite, he could be playing against a mixed field of complete beginners, occasional dabblers, and daily grinders. But when you’re as dominant in a game as Blevins is, even the more talented competition doesn’t pose much of a threat. That will never be the case in poker. Luck plays a far smaller role in the outcome of Blevins’ results than it does for any poker player. Instead, it’s his ability to navigate, experiment, and pick off other Fortnite players — regardless of skill level — which makes him so deadly, along with his work ethic. In 2019, we’re well aware of how hard the Super High Roller regulars are working on their games, constantly playing and studying in order to keep up with the competition. It’s something that Bonomo touched upon in that same PokerNews interview. It’s that element of luck and variance which means that we will never truly see someone dominate poker as Blevins does Fortnite. And, to be honest, nor would we want to. When it comes to online poker, however, the ability to stream games as Blevins does could mean that maybe, hopefully, one day in the not-so-distant future, we might have a player who is as popular. Blevins is both the best Fortnite player in the world (arguably), and the most popular Twitch streamer in the world (officially). That means for there ever to be a true comparison between Blevins and an online poker player, the latter would need to accomplish two things. The first would be to become (arguably) the best online MTT player in the world, topping the necessary rankings. And the second? Set up a Twitch stream. So far, Niklas “Lena900” Åstedt has that first one covered. Åstedt has undoubtedly been the most consistently great online MTT player of recent times, having topped the world rankings ever since May 19, 2018, according to PocketFives. Despite stiff competition from hundreds of the best online MTT players in the world, Åstedt somehow keeps managing to put up incredible results month after month versus the toughest fields to stay at the no.1 spot. To date, he has $14.3 million in online cashes, and that amount seems to increase every time he plays. But how does Åstedt crush so consistently? What has he figured out that other great players haven’t? These are questions that have the poker community scratching their heads. In a twoplustwo thread posing those very questions to the forum, we find some interesting takes. Anyone who has ever had played a poker tournament knows that you have to run well, win your flips, and have your hands hold up if you’re going to win. But after a solid 10 months as the world’s no.1 online tournament player — despite hundreds of other players putting in the work and grinding their arses off, too — citing “run good” doesn’t cut it when attempting to justify Åstedt’s success. “Doing things differently” might do a better job of that. Creativity based on study and experience clearly goes a long way in the mid-to-high stakes online world. Creativity is a trait that Fortnite fans associate with Blevins, too. His ability to come up with new moves on the fly and execute them perfectly (with thousands of eyes watching) is incredibly impressive. Take this example from a stream on April 2, 2018 in which Blevins rocket-rides his own homing missile without breaking a sweat. Blevins is the most popular streamer for more than one reason. Aside from being entertained, Fortnite players tune in to watch how Blevins plays, hoping they can pick up some new ideas and improve their own play. Can you imagine, then, if Åstedt had his own Twitch stream right now? Hypothetically, if Åstedt had the ability to host a stream like Lex Veldhuis or Blevins does, who among us wouldn’t tune in hoping to learn and improve and add some “Lena900” magic to our own games? But unlike Blevins, whose Fortnite Twitch streaming appears to have zero impact on his ability to win, Åstedt would no doubt run into some trouble if he were showing his competitors every move he made. The high stakes online MTT community is tiny when compared with Fortnite‘s player pool, and so in higher buy-in events Åstedt’s results could potentially drop — not to mention his world ranking — if his opponents began picking up on his strategies. The question then becomes whether or not it would be worth it for Åstedt to stream on Twitch, potentially decreasing his poker income, but also potentially increasing his overall income through Twitch subscriptions and fan donations. Only Åstedt can answer that, but he’s a man who prefers to remain out of the spotlight. Right now we’re pretty sure he’s content just being the best online MTT player in the world. Across all games streamed on Twitch, there’s often a debate between the “best players” and the “best streamers”. Many would say that when it comes to Fortnite, Blevins is both of those things. But many would also disagree. The “best streamer” title is subjective, after all. We all like different things. In the world of Twitch poker, though, there does seem to be one clear favourite right now. Lex Veldhuis is one of only a few dozen mid-to-high stakes poker players who opt to stream their tournaments live on Twitch, and his channel has become the biggest for a solo streamer in all of Twitch poker. At the time of writing, Veldhuis has 147,995 followers and more than 4,800 monthly subscribers. There are many parallels between the Twitch careers of Veldhuis and Blevins. 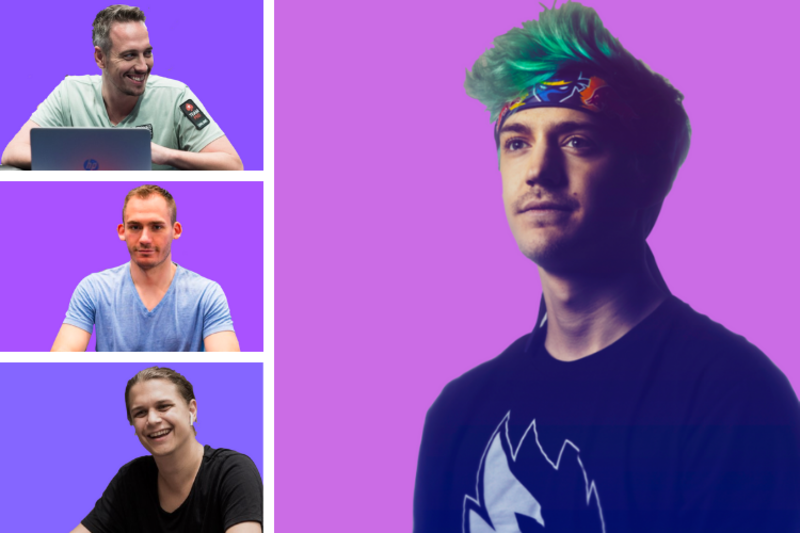 Like Blevins was in the gaming world, Veldhuis was obviously a professional poker player before he ever began streaming, and just as Blevins switched from Halo 3 to Fortnite, Veldhuis also made a big change in his daily grind. “I started streaming PLO,” Veldhuis told us. “I was playing $2.50/$5 and I’d have a $1,500 stack and it was pretty exciting. No one was playing cash games that high on Twitch. But people would come in the chat and ask me to play the Big $22! I was really surprised. None more so than Fortnite, which begins with 100 players and is whittled down to one sole survivor. But while Blevins doesn’t stop streaming until he’s won at least one Battle Royale each day (he can average 15 wins a day, and once got 29 in a single day), that will simply never be possible in online tournament poker. One victory alone is a reason to celebrate. That’s especially true when you consider how long an MTT takes compared to a game of Fortnite. When Veldhuis chopped the Bigger $109 for $19,000 a couple of weeks ago, he did so after being live on Twitch for close to 14 hours. The added pressure of revealing your hole cards to an audience, and having every play you make scrutinised, make Veldhuis’ tournaments that much more intense. We’re sure Blevins knows a thing or two about having his Fortnite play critiqued, too. It’s that drive, competitiveness, and sense of Twitch community which keeps streamers like Veldhuis and Blevins returning day after day. But maintaining your community once it’s built brings added pressure, too. When Blevins leaves his stream to take a few days off, his community suffers (“I lost 15,000 subs yesterday,” he told ESPN.com after one day away). Veldhuis has similar feelings towards his stream. It’s the same argument Veldhuis made to PokerStars Blog when we asked him why he didn’t travel more for poker. We’re certainly not complaining. Watching Veldhuis grow his Twitch channel over time whilst continuing to rise up the MTT ranks has been a pleasure. He’s living the dream, live on stream, playing a game that he loves for a living. Ready to start your own Twitch poker journey? Opening a PokerStars account is easy. Click here to get an account in minutes.